And you think our country is in trouble. Churchill’s top-secret and highly trained civilian army designed to wreak havoc on occupying enemy forces. This BAFTA Award-winning revisionist drama will be available on DVD and Digital on March 7 from Omnibus Entertainment, the specialty label of award-winning independent and foreign film distributor Film Movement. 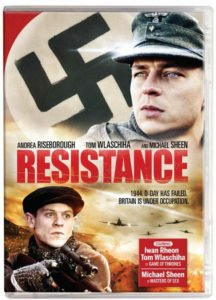 Starring Michael Sheen, Andrea Riseborough, Iwan Rheon and Tom Wlaschiha, Resistance, based on the acclaimed novel by Owen Sheers is set in Nazi-occupied Britain. D-Day has failed, and, as Panzer divisions and Nazi troops sweep westward across the dispirited countryside, Sarah Lewis (Riseborough), a young Welsh farmer’s wife, awakens to find that her husband, along with all the other men are gone, presumably having fled the village to join the top-secret BRO. Shortly thereafter, a small Wehrmacht platoon arrives in the pastoral countryside and sets up an outpost in the valley to root out the resistance. And when the severe winter forces them to cooperate with the locals, Sarah befriends the commanding officer, Albrecht (Wlaschiha), and the lines between collaboration, duty, occupation and survival are put to the test. Called “a beautiful, elliptical war film with the haunting qualities of a ghost story” by Empire Magazine, Resistance was nominated for the prestigious Cinevision Award at the Berlin Film Festival and a BAFTA Cymru Winner for Best Actress (Sharon Morgan).